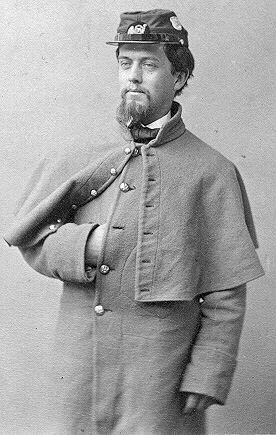 Cobb wears an enlisted man's sky blue overcoat. There is no visible circlet with his grade insignia on the sleeve. Circlets appear in the Schuyler, Hartley and Graham catalog. Officers were originally allowed to wear mounted enlisted men's overcoats by General Orders No. 102 of November 25, 1861. General Orders No. 286 of November, 22 1864 stated that it should be the same overcoat as the enlisted men of their command and that no ornaments were required. The circlet was therefore allowed but not required. On his Chasseur pattern forage cap is the badge of the 9th Army Corps worn on the left side in accordance with General Orders No. 66 of the 9th Corps December, 28 1864. In the front is an embroidered infantry horn with his regiment's number in the center. He also is wearing a cravat with the tie visible according to regulation.